This party needed to be budget friendly, so we decided to have the party at our house and set a strict limit on numbers (our house is narrow and not exactly minimalist, plus as it was December, there could be no outdoor play and there was a six-foot Christmas tree in the middle of the living room). So of course, we ended up inviting twice as many kids as we’d planned. Yay! This put the kibosh on epic lightsaber battles, and meant coming up with more contained (but still fun) activities.As G-Man has a gruesome sense of humour and was particularly keen on having a Sarlacc cake like this one, I decided to use Return of the Jedi for the inspiration for our games, and focused particularly on the scenes set in Jabba’s palace – surely a Hutt who knew how to party. Read on for brief descriptions of the different small-house-friendly games and activities from G-Man’s party. There’s also some links in this article to some of the things I bought or used – these are Amazon affiliate links, which means that if you click through and buy, I will receive a small (womp rat sized!) amount without adding anything on to the price you pay. Thank you so much for your support – it’s what keeps this website running. Click here for a more detailed description of the preparation and set up for this activity! Inspired by Fun-A-Day’s ‘Rescue Han Solo Lego science experiment’, we had to include the iconic rescue scene as part of our party activities. 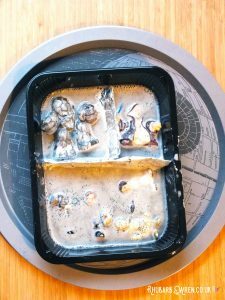 A dozen or so little Star Wars Galactic Heroes figures were duly frozen in carbonite (baking soda and water, with a squirt or two of paint and washing-up liquid), for our intrepid freedom-fighters to thaw out. The kids were divided into two teams, handed blasters loaded up with white vinegar and given strict instructions on where and where not to fire them; then they set to work! As the kids squirted the frozen blocks, the baking soda and vinegar reacted together to produce foaming eruptions that eventually freed the figures from their carbonite-y prison (with a little bit of help poking and bashing with forks – that carbonite was frozen good! )​But oh no! Not all of the figures were goodies. Snuck in amongst the frozen heroes were an assortment of stormtroopers and the evil emperor Palpatine himself. Carbonite melted, it was time to move on to the next task – sneaking out through Jabba’s throne room. Obviously they would need to do this in disguise, and so they were each given a stormtrooper or Captain Phasma mask to wear (and take home at the end of the party). Don’t Wake Jabba is basically musical statues… in reverse! When the music was off, the kids all had to pretend to creep carefully through Jabba’s sleeping throne room, just like Boushh/Princess Leia on her way to defrost Han. Whenever the music started up, they had to freeze, pretending to be carbonite statues until the music stopped again and Jabba went back to sleep. They got a prize (a Star Wars sticker) for being especially still or for making particularly great frozen grimaces, a la Captain Solo. A nice little warm up for this game is to practice gruesome frozen faces and poses before beginning, so all the kids are confident about what they’re doing. It’s also lots of fun!As we were tight on space but had a fairly long room, the kids were given a target to aim for – Uncle M’s vintage AT-AT, containing a bag of Star Wars Wikkeez heads. Each child had to get to the AT-AT, collect one Wikkeez head and make it back to the start point… without waking up Jabba. Attending parents were roped in to be dozing members of Jabba’s entourage. We used the Cantina band music from ROTJ because K-Dog refused to allow the actual music from Jabba’s palace (his reason being it is beyond awful). We played until all the kids had made it from one end of the room to the other, and had all won a sticker or two. It was lovely to see how the kids who made it back first all were all rooting loudly for the others. When the final child got back to the safe zone with her Wikkeez head, the whole group let out a spontaneous cheer. 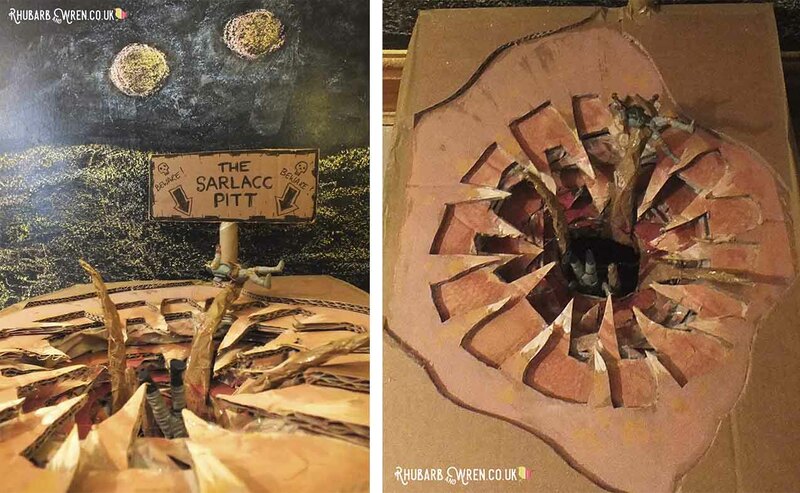 Any ROTJ aficionado will know that the Han Solo rescue mission didn’t end with Carbonite defrosting; next came a road trip to the Great Pit of Carkoon, where the heroes were to be fed to a tentacled giant mouth known as the Sarlacc. 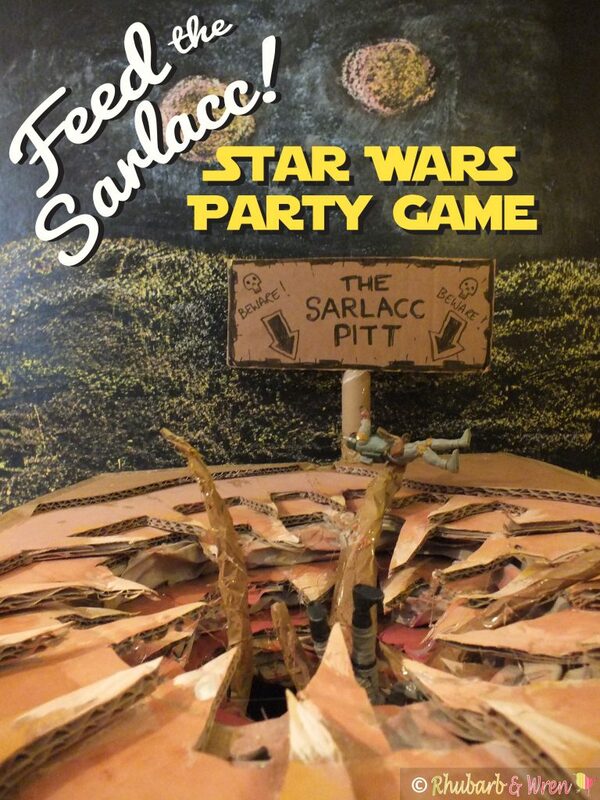 Some pre-party cardboard crafting by G-Man’s highly talented aunt and uncle resulted in our very own Sarlacc, into which the kids took turns trying to feed the newly defrosted Galactic Hero figures. Score a hit, win a sticker! ​Each child got three turns trying to throw a figure into the mouth, before we declared the Sarlacc full, and announced it was time to feed them instead. Lunch was an Imperial Picnic – Hot dogs, Death Star Pizza Pockets and party food bits – with Return of the Jedi on the telly and a giant tub of popcorn. After cake and party biscuits, it was time to return to the serious business of party games. Whatever you do, don’t drop it! A Star Wars-y twist on the old party classic, Pass the Parcel. Sneaky Bobba Fett had escaped the Sarlacc and tried to get his revenge on the kids by planting a thermal detonator in the party.​The kids had to pass the bomb around while the music played, and then whomever was left holding it when the music stopped had a countdown of five seconds to remove a layer. If they took more than one layer, the bomb would go off. If they held on to the bomb for longer than the count of two while the music played, the bomb would go off. Luckily, the kids were up to the challenge, and the final layer was defused successfully without the bomb exploding. Phew! 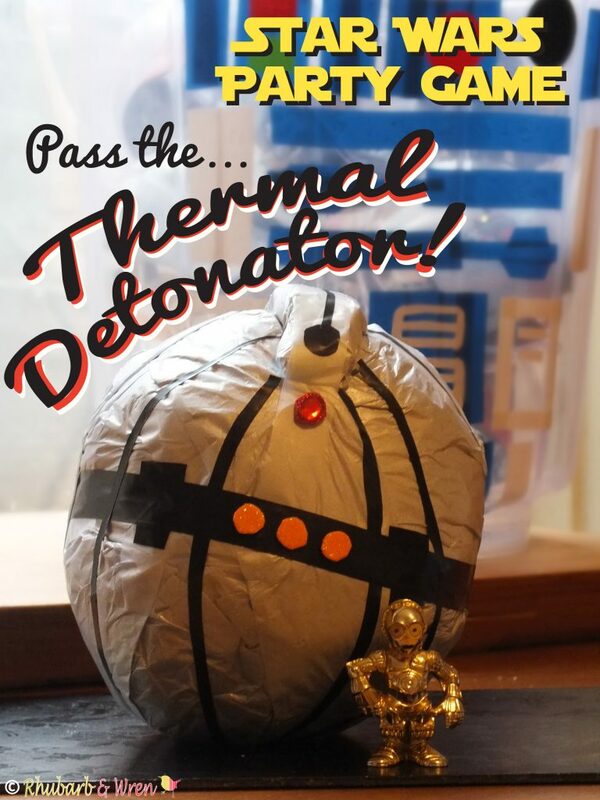 To make the thermal detonator, I started with a large clear plastic bauble (a left-over from the final activity, below) containing the prize – a Star Wars micro machine. I wrapped this is red tissue paper so that we’d know this was the final layer, and stuck a bag of can’t-go-wrong Haribo onto it. Then I carried on wrapping, alternating different colour metallic tissue paper (so it would clear to the children what layer to remove) with a bag of Haribo on each. I did enough layers for one per party guest, plus a couple of others *just in case*. The final layer was metallic silver, and I saved a rectangle of this paper to wrap around some bubblewrap for the top of the detonator. A bit of black electrical tape (LOVE that stuff!) and some stuck on jewels for lights, and bob’s your thermal detonator.This was a BIG hit at the party – the kids really got into the idea that the parcel was a bomb, handling it ultra-carefully and defusing each layer with dramatic aplomb! It was much more entertaining than a simple pass-the-parcel game would have been, but really didn’t involve much more effort to make. This was the final activity of the party – a quieter, focused task to engage the kids while parents started arriving to take them home. In order to escape at last from Tatooine, the kids needed new vehicles (we’d proven their original ones un-spaceworthy!). Luckily, we had an R2 unit which held stolen, secret, Imperial Death Star Construction Company plans for a number of more robust vehicles. ​Each child did a lucky dip in R2 to retrieve a Death Star containing the plans and Lego parts to build it. This was part of their party bag loot, so they could take it home and finish if necessary. We were inspired by this water urn to turn a cheap plastic bucket into our own R2 unit using blue and white electrical tape, and a few squares (and circles!) of coloured paper. The electrical tape is satisfyingly vinyl-y, and the whole transformation was amazingly quick and easy.​The Death Stars inside R2 were large plastic baubles (it was Christmas time, after all!) bought cheap from a craft shop. They were transformed into Death Stars with a strip of silver gaffa tape and a circle cut from the same stuff. Inside were the pieces for a Lego mini kit that I’d got cheap (again!) from Ebay, while the instructions (or Top Secret, Death Star Construction Company vehicle plans) were in brown envelopes to make the lucky dip completely random. The kids had a great time at the party, as did the grown-ups! As we didn’t have room for nine kids to run rampant, the key thing was making sure that there was a focus for them that was entertaining and yet not too physical – there just wasn’t space for that. This meant ensuring we also had a quieter option set out for those that needed a break. Birthday, Cake, Party, Party Time, Star Wars. Bookmark.